There’s nothing like bottom heat for starting seedlings or propagating cuttings. 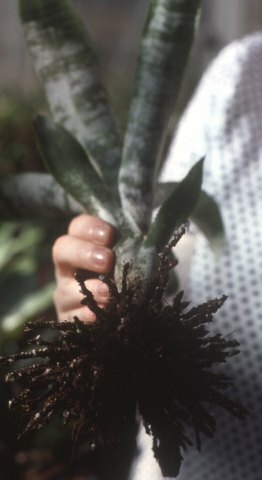 If you don’t believe me, look at the roots on this Aechmea fasciata pup! Cut the 2x6 into four pieces, two four feet long and two 21″ long. Set up the box on a level surface, with the two 21″ pieces inside the ends of the two four foot pieces. This will insure a flat finished box. Drill two holes (approx ¼″ diameter) ¾″ from the end of each four foot piece 1½″ from the top and bottom. This will roughly center the holes. Drill about ½″ into the end of the smaller pieces. When done, fit drill with a smaller pilot sized bit (a little smaller in diameter than the screw) and drill 2½″ holes into the ends where the original holes were started. Fit your drill with a hex socket if available and screw in each of the bolts. Since your box may not be perfectly square, don’t go quite in all the way. 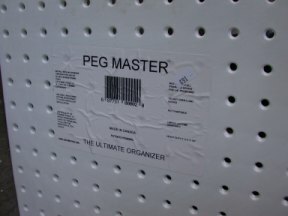 Put the box flat on the floor and fit the “Peg Master” plastic pegboard on top. Square up with the box. Drill small pilot holes in every fourth pegboard hole on the outside edge. Hammer in the roofing nails. Finish the bolts with a socket if necessary. Cut the Styrofoam into pieces fitting the sides first. This will allow water to drain out the bottom without keeping the wood wet. Secure the Styrofoam to the wood and plastic using the paneling adhesive. This is not critical since gravity will keep the bottom in place and the soil mix will tend to keep the sides in place. Once dry, cut a series of small holes from the bottom through the holes in the plastic through the Styrofoam. This provides drainage. Go slowly so you don’t blow out the Styrofoam when you come out the other side (the top). Since things are getting heavy, now prepare the location for the box. It should be relatively level. The box can sit on the ground or be placed on a series of 2x2″ or 3x4″ planks (think bed slats). The only concern is that the plastic needs to be supported at several places in the middle since the moist mix will be fairly heavy. If the box sits right on the ground the galvanized nails will eventually rust (but not for quite a while). Lay in about ½″ of sand on the bottom. 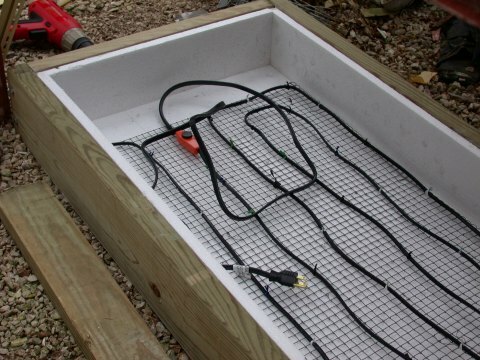 Press in the wire mesh with the attached heating cable on the bottom side if the thermostat will allow. Mine was too large and I put the cable on top. Just don't leave pups in too long or the roots will envelope the mesh and cable!. Fill with your favorite propagating mix. You can add a “Quonset hut” style roof of clear plastic on fiberglass rod hoops to maintain humidity.